The Women's Speed Chess Championship is kicking off in May, beginning with a qualifier which will be taking place May 8 at 10 a.m. PDT with the winner earning the right to face top seed GM Kateryna Lagno in the first round of the championship on May 22. Each match of the 2019 Women's Speed Chess Championship including this qualifier will be hosted by commentators IM Anna Rudolf and IM Sopiko Guramishvili and will be broadcast live only on www.Chess.com/TV and www.Twitch.tv/Chess. 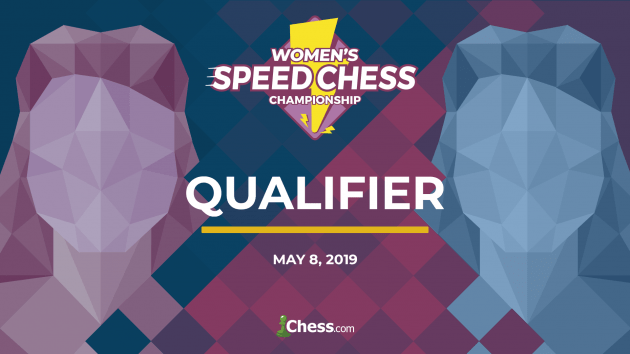 The Women's Speed Chess Championship Qualifier is a first-of-its-kind event open to all titled women who will play a 10-round Swiss qualifier with the winner walking away with $750 and a spot in the Women's Speed Chess Championship main bracket which will begin play on May 22. The runner-up will take home $250 for their efforts. Some of the top women's speed chess players are expected to participate, making this one of the top events of the year in chess. Qualification will open on May 8 at 9 a.m. PDT, exactly one hour prior to the start of the tournament. The Women's Speed Chess Championship will feature a field of eight of the world's best women chess players, and a substantial prize pool of $20,000. The winner of the WSCC will also earn a place in the main Speed Chess Championship and its additional $50,000 prize pool. Aside from Lagno, other key participants include former Women's World Champion GM Alexandra Kosteniuk, seven-time U.S. Champion GM Irina Krush and three-time European Individual champion GM Valentina Gunina. Be sure to tune in to www.Twitch.tv/Chess and www.Chess.com/TV for all the action of this year's 2019 Women's Speed Chess Championship and visit www.speedchesschampionship.com for more information on the other Speed Chess Championship events taking place this summer including the inaugural 2019 Junior Speed Chess Championship presented by ChessKid.